Tribulus is an annual herbaceous plant, which has a thin root straight and branched prostrate stems reaching a length of 120 cm Leaves of Tribulus paripinnate, up to 8 cm Flowers the plant has a single yellow and located in the leaf axils. Tribulus contain glycosides, which are synthesized by a series of hormonal drugs such as cortisone and progesterone. Steroidal saponins (nitrogen-free glycosides) have on the body anti-sclerotic effect, increases peristalsis, and promote intensive biliary excretion, have small hypotensive effect. They show high antimicrobial and antifungal activity. Contained in the plant flavonoids that thin the blood, prevent the formation of blood clots. Tincture of Tribulus terrestris composition. Tincture of Tribulus terrestris properties. All these properties are related to the ability of Tribulus terrestris to stimulate the pituitary gland and hypothalamus, increasing secretion luteotropin. This peptide hormone in women, stimulates the production of estrogen and men have testosterone. effective in the prevention of urolithiasis. Preparations of Tribulus have anti-tumor, diuretic, astringent, tonic and wound healing properties. Tincture of Tribulus terrestris application. Tribulus in traditional medicine are a popular and versatile tool. Decoction of plants to treat male and female infertility, using it as an aphrodisiac, prescribed as a means of stimulating potency. Extract of Tribulus terrestris is considered alterative, tonic, able to help easier to move a heavy physical, mental and mental stress, improve the body's resistance in severe disease. The infusion of Tribulus terrestris take for constipation, for stimulation of bile production, as a diuretic. According to traditional healers, this infusion is able to cope with migraines, insomnia, colds and even tinnitus and gonorrhea. It should be drunk with cystitis, pyelonephritis, urethritis and other inflammations of the urogenital system. When applied topically it is considered an effective healing tool that is able to cope even with burns, it is used with conjunctivitis, they wipe the skin, trying to get rid of acne, fungus, inflammation. The fresh juice of the plant is used in the treatment of scrofula. anti-inflammatory (cystitis, urethritis, pielonefrita, various inflammation of the bladder). 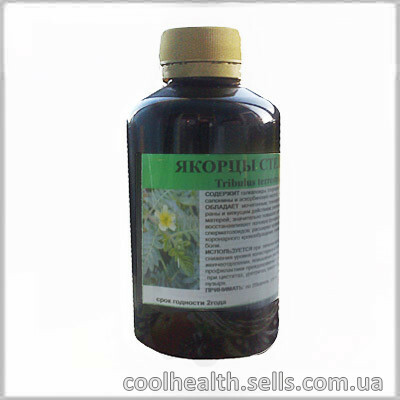 Tincture of Tribulus terrestris uses for athletes. The subject of scientific debate was the effects of drugs (tinctures) on the basis of Tribulus terrestris for athletes. Initially it was assumed that the composition of food additives plant is able to act as anabolic agents, accelerate muscle growth, increase power performance. The series of experiments refute this hypothesis. However, infusion of Tribulus terrestris may be useful for bodybuilders because it can raise testosterone levels and thus fight depression and low libido caused by taking anabolic steroids. Tincture of Tribulus terrestris contraindications and side effects. The infusion of Tribulus terrestris should not be taken by pregnant, diabetics, hypotensive patients and those suffering from benign prostatic hyperplasia. Not recommended this extract persons under the age of 18 years. There are concerns that chronic administration of Tribulus contribute to the development of cervical cancer and cancer of the breast and increase the size of the prostate. Application: Use 20 drops in the morning.